The People’s Project – we’re into the final 5! We are pleased to announce WE ARE THROUGH TO THE FINAL FIVE OF THE PEOPLE’S PROJECT, Big Lottery (Calendar South)! The top three projects who win the most votes receive funding for a year to continue and develop the great work in the community! ITV filmed one of the many projects we have been working on and will be on Calendar ITV, 2nd April 2019, 6.30 pm. You can view the film here. 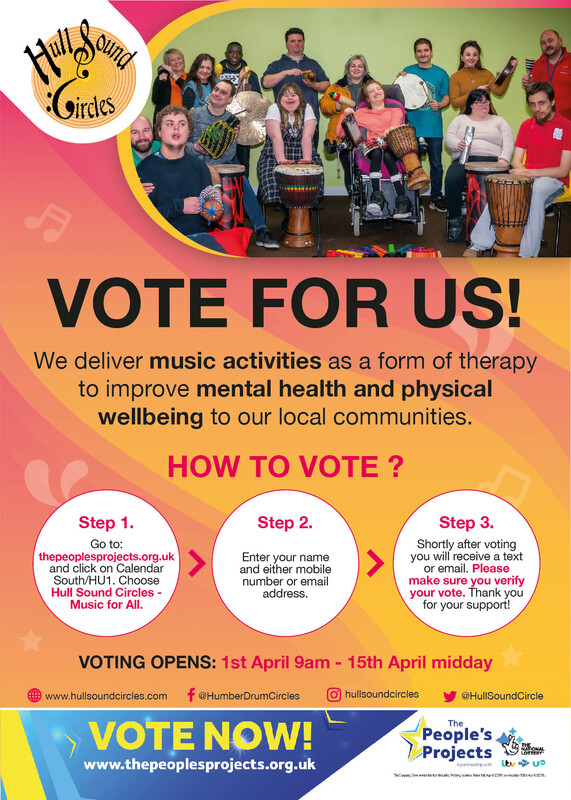 The voting will open Monday 1st April, 9 am and closes Monday 15th April, 2019, noon – two weeks only to collect votes! WE NEED YOUR HELP! For the People of Hull, delivered by the People of Hull. CLICK HERE to enter our profile on The People’s Project website, then click “Add to votes” button in the right corner. Enter your name and either mobile number or email address. Shortly after voting you will receive a text or email. Please make sure you verify your vote. Thank you for your support! Music for All provides music making activities as a form of therapy to improve mental health and physical wellbeing. We aim to empower, connect and bring joy through music to those in challenging circumstances. We work with people of all ages and backgrounds; adults with physical, learning and developmental disabilities, people with dementia, people experiencing isolation and depression, children with special educational needs, disabilities and refugee families. Playing music together brings us into the present moment, providing relief from everyday worries and physical ailments. There is academic evidence of how music is highly beneficial to reducing stress and releasing the happy chemicals in the brain, reducing cortisol, increasing dopamine and serotonin. The Music for All project has been a huge success so far, we have received positive feedback from all the organisations we are working with: Alzheimer’s Society, Age UK, Endike Community Care, 5Senses, Your Life, Refugee Council and Kids. Provide weekly music sessions – inclusive, therapeutic and educational, tailored to each group from Sound therapy, Singing, Drum Circle, West African, Soundscape and Gamelan. Deliver two Sound Therapy sessions per month to the staff, carers and families of all our groups. Develop an album of original music from each organisation, mastered in a professional studio. Each organisation can then sell their album to raise money for their groups. Saturday Music Club – Free activity for all participants, carers, staff and families. Employ local music facilitators and support musicians. Copyright © Hull Sound Circles 2019. All rights reserved.